It is not possible to have windows or views of nature in every interior space. Although the benefits of sunlight and exposure to other natural elements are widely recognized, windowless interior rooms are open an architectural necessity. SkyCeilings from The Sky Factory offer illusions of sky that are used in such areas to trigger relaxation in building occupants. They are ~ photographic images of real skies that fit into standard drop ceiling grid systems. 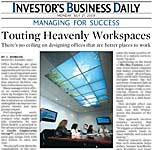 More possibilities are available with Luminous SkyCeilings, which feature a light box to distribute daylight, fluorescent, or LED lighting for illuminating translucent images from behind. SkyCeilings fit into 2x2, 2x4, 60cm x 60cm, or custom grid systems. Luminous SkyCeilings require 9" or 24cm of overhead clearance rom the bottom of the grid to the hard ceiling deck. Because they are modular, SkyCeilings can be designed for any size or shape. his ceiling installation typically uses 6500 Kelvin (K) daylight balanced T5 fluorescent lamps. T5 fluorescent lighting is energy efficient (offering seven watts per square foot) and long lasting. The combination of these two qualities makes T5 the most common and affordable of the lighting systems available for use with SkyCeilings. Fluorescent lighting systems can also be fitted with an optional dimming system that includes manual, remote, or programmed switching. With this lost option, a digitally addressable lighting interface (DALI con be set to produce a wide range of effects. In healthcare facilities, this function may help patients maintain circadian rhythms and speed healing. In environments where workers are on duty throughout the night, the Luminous SkyCeiling can be programmed to increase light intensity when the body is normally set for the deepest part of the sleep cycle. This function may help establishments aiming to keep patrons awake (such as casinos). Another programmable function involves a subtle switch from 2800K (the warm color of a rising and setting sun) or 6500K (the cool color of midday daylight). Light levels and color temperature both change in synchrony with actual conditions. The most common style of SkyCeiling is the Luminous Rectilinear SkyCeiling, which can be arranged in any rectilinear shape or fit according to a standard ceiling grid. Circular Luminous 360 SkyCeilings form a circular shape and are designed to reinforce the human field of vision with on alternative to rectangular boundaries. Another option is the MRI Luminous SkyCeiling. This uses RFfreeLux LEDs, which incorporate the some light that is used to treat Seasonal Affective Disorder (SAD). This type of lighting illuminates images evenly to eliminate the hotspots, striping, over illumination, shadows, or fall off that con occur with other lighting fixtures. RFfreeLux LEDs meet requirements for radio frequency interference free environments. They are used in confined MRI spaces to produce a feeling of openness and calm in patients during radiological procedures. Similarly, VIP Personal Luminous SkyCeilings can be installed over individual workstations, hospital beds, or other spaces. Some research supports the theory that patient recovery in healthcare settings may be affected by environment. Roger Ulrich, professor of architecture and landscape architecture at Texas A&M University in College Station, TX, has completed research on the relationship between nature and healing. In his study published in 1984, Ulrich showed that gallbladder patients had a faster recovery time and required less pain medication if they had a view of a tree outside a window (in contrast to patients who looked out on a brick. wall). In later studies, he proved that patients with images of nature in their rooms had shorter recovery periods. These results can be explained through two types of mechanisms. The first is distraction theory, which holds that pain absorbs more attention; the more attention devoted to pain, the greater the experienced intensity. When patients are diverted, they may allocate less attention to pain, which is then reduced. The second mechanism is stress reduction. When stress is lessened (which may occur when viewing nature) levels of hormones such as nor epinephrine may be decreased, which could also alleviate pain and speed healing. SkyCeilings from The Sky Factory can be used in a variety of interior environments, including retail spaces, conference rooms, offices, spas, hotels, restaurants, and, of course, healthcare facilities. This system may offer facility managers a new tool to produce a positive response from occupants in isolated interior spaces.